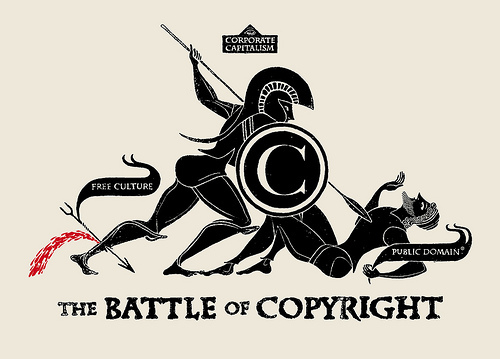 The Battle of Copyright. Photo taken by Christopher Dombres on June 9, 2011. Public domain. Retrieved from Flickr. Is This Work Still Covered by Copyright? Works no longer covered by copyright move into the public domain. The Digital Copyright Slider will help you to determine whether a work published within a certain period is still covered by copyright. Is This Work Fair (and Free) to Use? The "Checklist for Conducting a Fair Use Analysis Before Using Copyrighted Materials" published by Cornell University's Copyright Office will help you determine whether your use of a copyrighted work is fair and legal. Minnesota State provides flow charts for determining fair use of different types of media for face to face and online instruction, e-textbooks, course packs, and course management systems. Unless a content creator (as an individual, a publisher, or a business) has established a cost and restrictions for use of their materials, a content user must conduct a fair use four factor analysis to determine whether or not they can use the work for free, particular for instructional materials. How Do I Get Permission to Use Work? All works submitted to the SCSU Institutional Repository--theses, dissertations, and other scholarship and creative works--must have all permissions cleared prior to uploading of those works. Please contact the Collection Management Librarian Rachel Wexelbaum for more information on how to do this. Students, faculty, and staff who intend to publish works that include non-Creative Commons licensed photos, images, or texts from other sources must get permission from those content creators. Minnesota State provides tools and forms to determine when and how to seek permission for such resources. Faculty who intend to create textbooks, course packs, or online classes with non-Creative Commons licensed photos, images, or texts from other sources must get permissions from those content creators. Minnesota State provides tools and forms to determine when and how to seek permissions for such resources. Faculty who wish to make multiple copies of book chapters or journals should contact the Collection Management Librarian Rachel Wexelbaum prior to doing so, as use of these materials may require Copyright Clearance Center fees. Legal and Free to Use! For online classes, presentations, and non-commercial performances, check out these Legal and Free resources! These resources are legal and free to use for online instruction, presentations, and non-commercial performances! While these resources are legal and free to use, credit all content creators of this free media! Copyright is a legal protection for people who create original works fixed in a tangible medium of expression. Copyright covers publications for profit, open access publications, and unpublished works. For more information about copyright, please visit "Copyright Basics, Circular 1", published by the U.S. Copyright Office. I Have a Copyright Question! Email our Collection Management Librarian Rachel Wexelbaum with any questions related to copyright, fair use, public performance rights, or Creative Commons. If you have legal questions, please contact Judith Siminoe, University Special Counsel. Creative Commons (CC) is the medium that allows content creators to communicate how they want to be credited and how they want their work to be used. For more information on Creative Commons, please visit our Creative Commons subject guide. Fair Use is a legal doctrine that permits the unlicensed use of copyright-protected works in certain circumstances. For more information about fair use, please visit "More Information on Fair Use" published by the U.S. Copyright Office. Intellectual property includes "creations of the mind, such as inventions; literary and artistic works; designs; and symbols, names and images used in commerce". For more information about intellectual property, pelase visit the official website of the World Intellectual Property Organization. Performance rights include the right to perform in public and the right to screen media to the public. Classroom performance rights involve the rights to perform or screen media for face to face or online instruction. Permissions involve written consent to use someone's name, image, or work under particular terms. Public domain describes the status of literature, music, or other works whose copyright period expired or whose authors have given permission to use their work without restriction. For more information about the public domain, please visit Stanford University Libraries' Copyright & Fair Use page. The TEACH Act, also known as the Technology, Education, and Copyright Harmonization Act, allows for the performance and display of copyrighted materials for distance education by accredited, non-profit educational institutions in particular circumstances. For more information on how the TEACH Act is applied to using media for online learning, please visit the Copyright Clearance Center's brief guide to the TEACH Act. Work made for hire. A work made by an employee as part of their assigned duties, or a work specially ordered or commissioned for use. For more information please visit "Works Made for Hire, Circular 9", published by the U.S. Copyright Office.